As I sit here on my bed, otherwise known as my office, Sunday light streaming through my window and Sam Cooke bopping from my speakers, I can’t think what to write. My toes are tapping and I want to go outside. I suppose I’ll just get straight to the squash. I know come February I’ll be entirely sick of it, but I can’t help it – I’ve started in on the cool weather squash. Smooth or nubbly, dark green or deep orange, long-necked or squat – I need the squash. In my kitchen. Pretty much now. Hearty and versatile, winter squash keeps forever and goes both ways in the sweet or savory department, as happy in a bowl of soup with croutons as it’d be in a slice of pie, topped with toasted marshmallow. But, I’m getting ahead of myself. Let’s just take things real slow. Let’s start with roasting. Maybe topping with sharp arugula and parmesan. There’s still plenty of time for pie. These squash “bowls” would be a beautiful first course at a dinner party or, on their own, would make a perfectly delicious light lunch or dinner. Preheat the oven to 350 degrees F. Line a cookie sheet with tin foil. 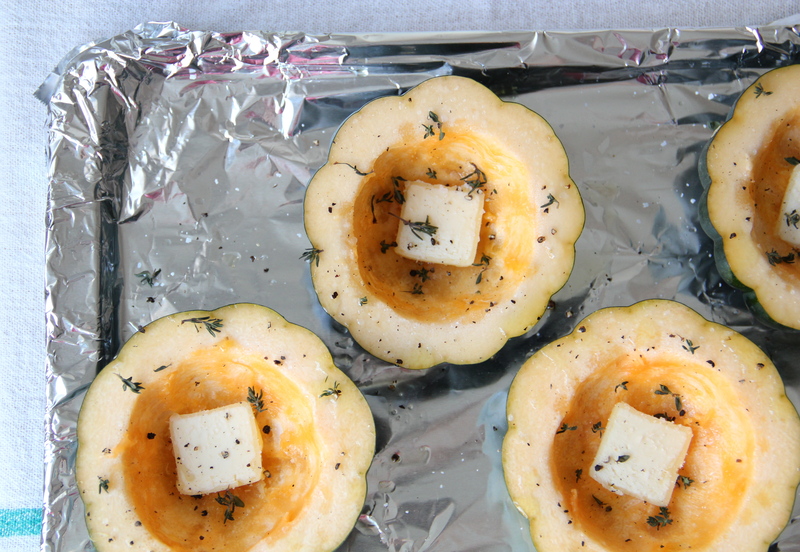 Place the squash, cut side up, on the foil-lined baking sheet, and drizzle lightly with olive oil. 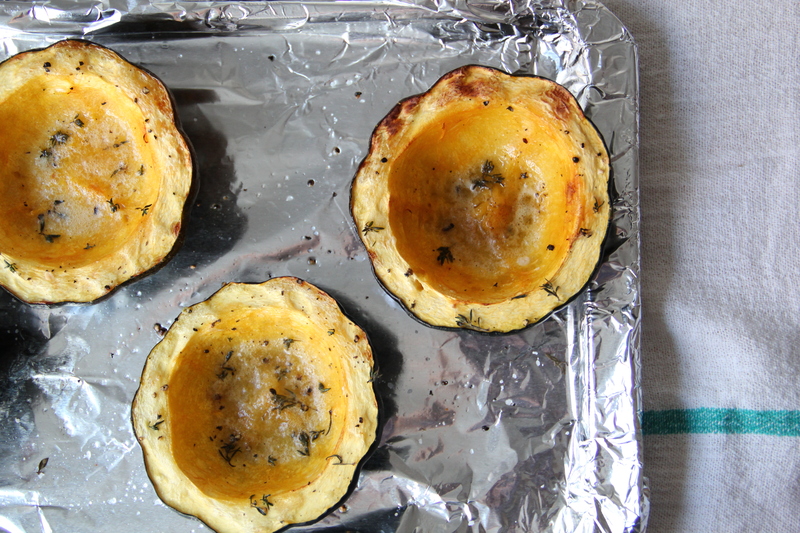 Place a pat of butter in each squash bowl, and sprinkle with salt, pepper and thyme. Roast the squash in the oven until lightly browned and fork tender, about 40 minutes. While the squash is roasting, place the arugula in a medium sized bowl. Squeeze the juice from 1 lemon over the arugula and drizzle with a bit of olive oil, then sprinkle with salt and pepper. Toss lightly. 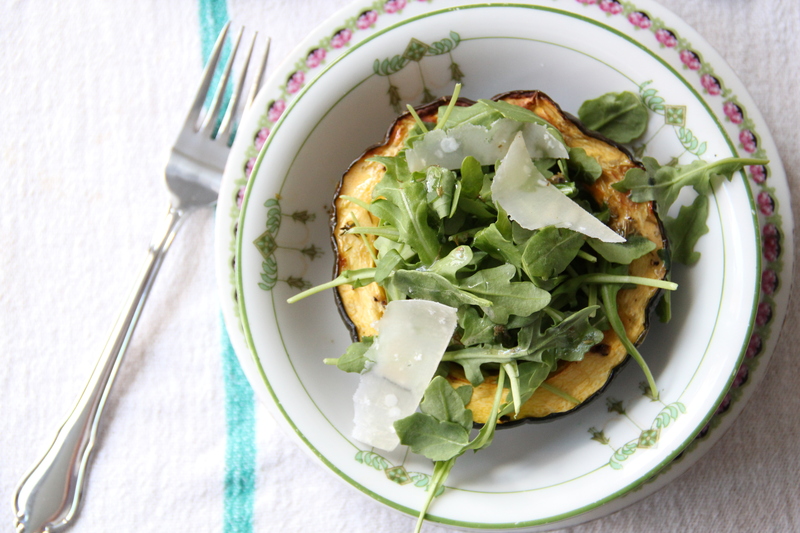 When the squash are out of the oven, let them cool slightly before placing the halves on plates, piling arugula high inside the “bowls,” and shaving parmesan cheese on top. Serve immediately. This is lovely! 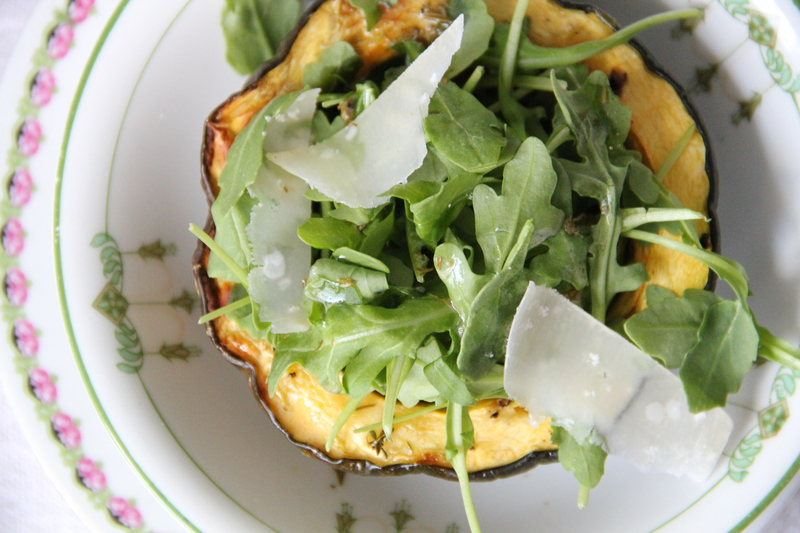 Arugula and parmesan always compliment each other wonderfully, and roasted squash is so delightfully seasonal – yumm. THIS LOOKS AMAZING!! Can i please have some?? I have one of these babies on my kitchen table and I can’t wait to get my hands on some arugula so I can recreate these immediately. Yum! yes! easiest dinner imagineable! I mean, probably. These look like a delicious and easy crowd pleaser. I will make them for dinner tonight. Any suggestions for a light side dish to accompany? I ate mine with a side of edamame for protein, but if I wasn’t so lazy I might have gone with a simple roast chicken breast or piece of meaty fish. let me know how yours turns out! I just made something similar this week except with frisee and barley…wish I had seen this earlier because those squash bowls are pretty! I’ll try this out on my next squash. 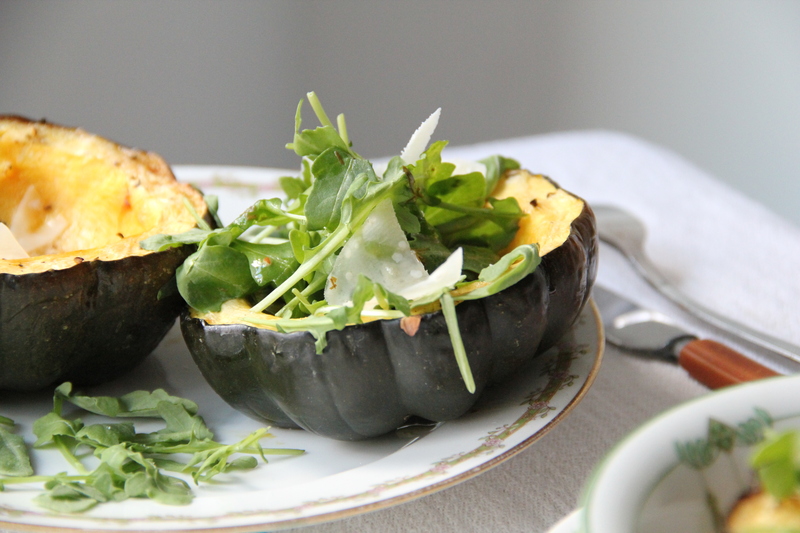 this was a truly lovely way to have acorn squash – had arugula in the garden & a squash hanging around on the counter…what a perfect combination! I ended up tossing the pooled butter into the lemon juice to dress the arugula, but that’s the only thing I changed. We had it w salmon, yummy – thanks!